Heat stove top skillet to medium. Use hands to blend ground beef with chopped bacon, shredded cheddar cheese, chopped fresh chives, onion powder, garlic powder, and salt & pepper. Mold into a ball. No need to oil pan. Add beef patty to skillet. If available, use a cast iron press on each side. Cook patty approximately 10 minutes on each side (adjust your time accordingly if you prefer rare or well done beef patties). While burger is cooking, interlock raw bacon into a square basket weave (see photos). Place bacon onto skillet. Cook approximately 5 minutes on each side. Turn heat to low. 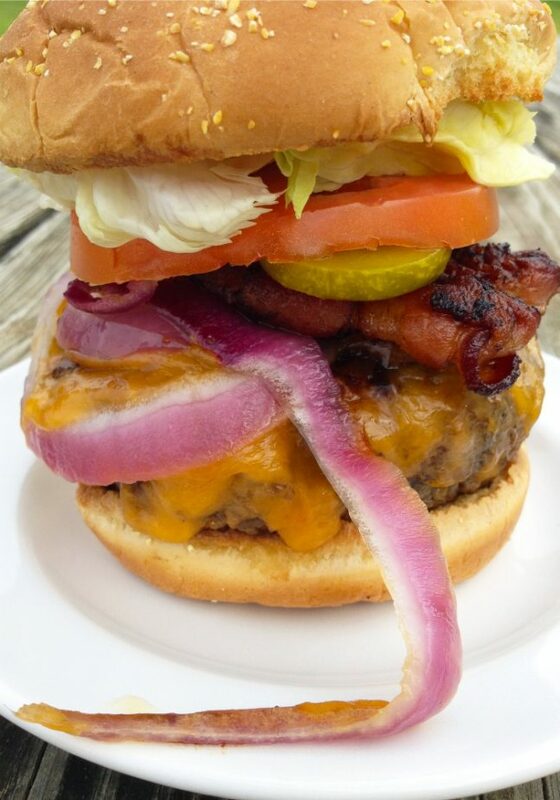 Add shredded cheddar cheese, red onion rings, and bacon basket weave to burger. Place lid onto skillet. Wait 2 to 3 minutes before removing lid. Remove burger from heat and set aside. Place bun onto aluminum foil and into oven. Bake for approximately 5 minutes. Plate burger atop bun. Add pickle, tomato, and lettuce. Serve immediately. For a delicious Tex-Mex twist, mix 1/4 to 1/2 cup diced jalapeño into the patties before cooking. Top with fresh sliced avocado and a twist of lime. Enjoy!